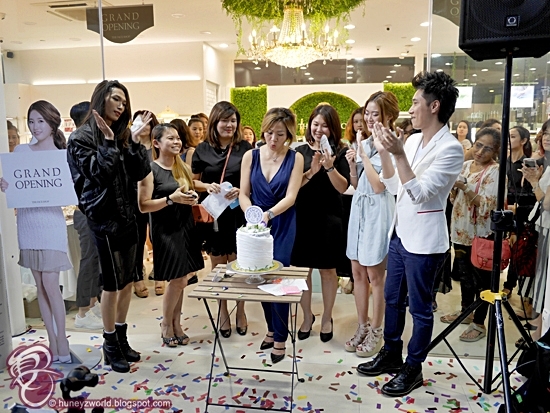 Celebrity Dasmond Koh, Kiss 92 FM DJ Charmaine Yee, Leading Influencer Christabel Chua, leading choreographer Andreas Chua and DJ Eclipse Ivan Chia and Ms Joyce Teh, the President of the THEFACESHOP and marketing team at the cake-cutting ceremony to officiate the opening of THEFACESHOP Flagship store. 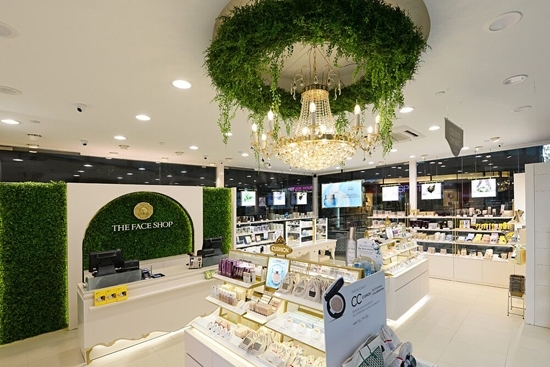 With a touch nature and shimmering glamour of gold and crystals, THEFACESHOP welcomes you into their flagship store at Tampines 1. 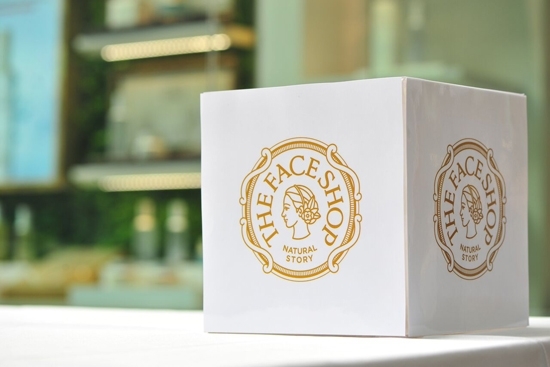 Their revamped logo revolves around the concept of the goddess of nature - Demeter and the store resembles the fertile harvest under her care. This east side flagship store at Tampines 1 is 840 sqft and is the first store to reveal the new look. 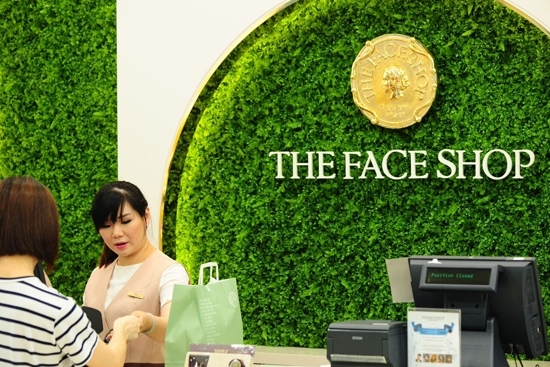 Subsequently, the TFS stores in Singapore and South East Asia will adapt to this fresh new look. 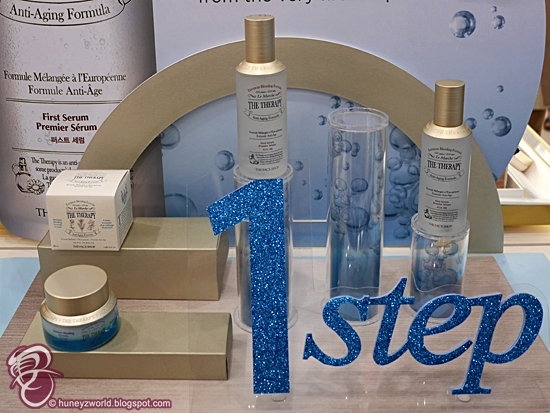 It's every girls' playground here with a wide array of products from Skincare, Cleansing, Make up & Body, Hair and Suncare. 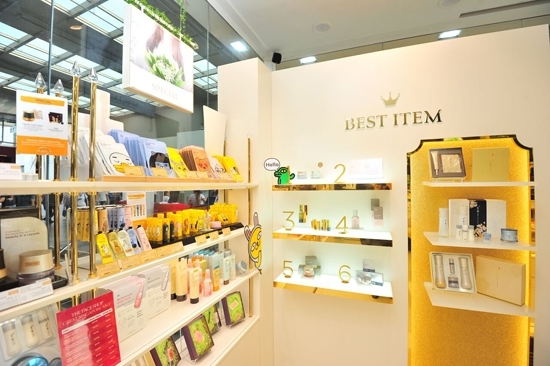 There's a dedicated section for you to consult the sales personnels and get some beauty tips or some beauty touch up right infront of the mirrors! 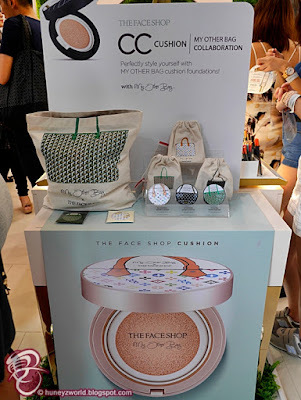 At the opening, celebrities Dasmond Koh, leading influencer Christabel Chua, Host kiss 92 FM DJ Charmaine Yee, Singapore's leading choreographer Andreas Chua and leading south east asia DJ ECLIPSE were there to celebrate the momentous day. 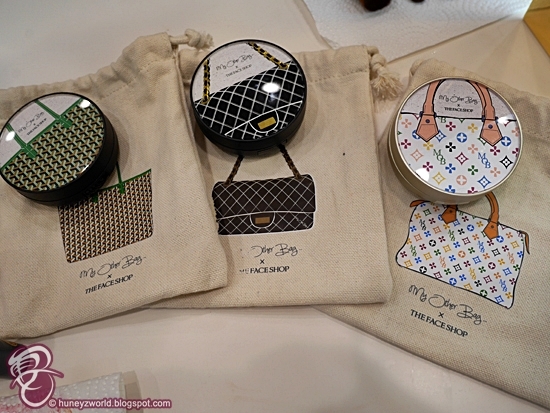 Dasmond Koh endorses the Men’s latest range know as The Fresh whilst Charmaine Yee, Christabel Chua DJ Eclipse & Andreas Chua talked us through the new range of The Therapy. 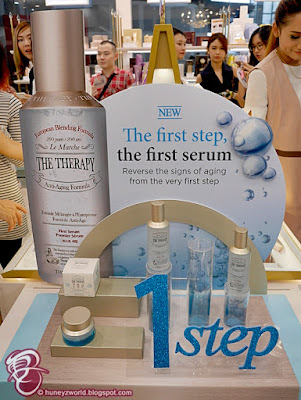 Being THEFACESHOP's premium line, The Therapy's First Serum and Royal Made Moisture Blending Cream are here to help replenish moisture in your skin, keeping it firm and lightweight perfect for the summer. 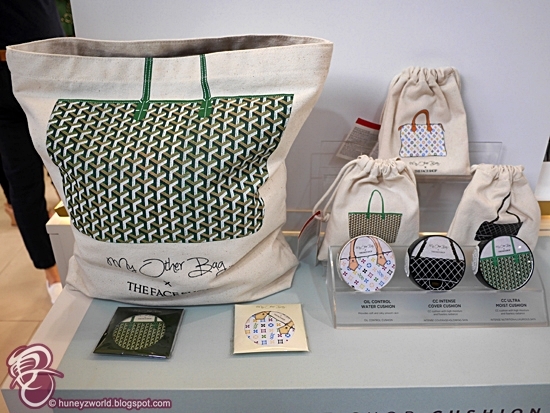 Christabel Chua also showed us her favourite buys, including the Limited Edition Cushion, which THEFACESHOP collaborated with My Other Bag to showcase 'IT' bags inspiration on their cushion covers. 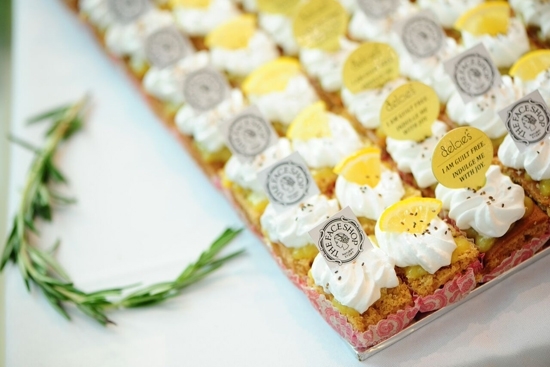 It was a great night ending with DJ Eclipse spinning Korean music together with TOP 40s for whilst we enjoy exclusive drinks by Perrier and desserts by Delcie. 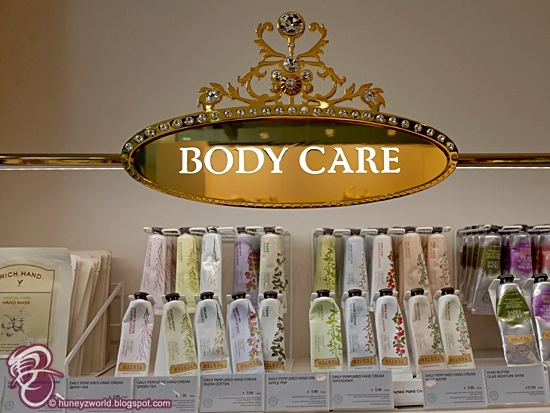 Have fun shopping and pampering yourselves at their flagship store! For more information, follow them on Instagram @thefaceshop_sg or Facebook @thefaceshopsingapore.